For GWAR fans, the pilgrimage to the annual GWAR B-Q in Richland, Virginia is akin to Elvis fans traveling to Graceland. I have always wanted to go since the first GWAR B-Q in 2010 but was never able to justify the cross-country trip; however, when I learned that lead singer Dave Brockie aka Oderus Urungus passed away and that there would be a memorial before the concerts, I knew that I had to go and pay my respects. For me this was the experience of a lifetime—more than I could ever fit into one article so instead, this will be the first in a series of three articles covering different aspects of the event. When I arrived at Hadad’s Lake (not the easiest place to find) I was surprised to see a massive line at what I had thought was a free event. Turns out the line was for beer. I took a look around first and then decided to join the masses and for good reason, this was not just any beer. This was GWAR beer! 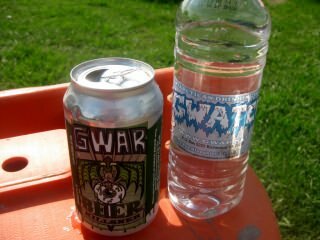 They also had GWATER! Now was it the best beer I ever had? Well no, but it did hit the spot and I drank it proudly over the weekend. With my refreshments in hand, I set out to explore. I found the main stage decorated with GWAR banners. A few hundred feet in front it was a smaller one with a roof over it. Then I found Oderus, the most infamous Scumdog of the Universe. When Dave Brockie passed away so did alter-ego Oderus. This memorial was for him. He was more than a character. 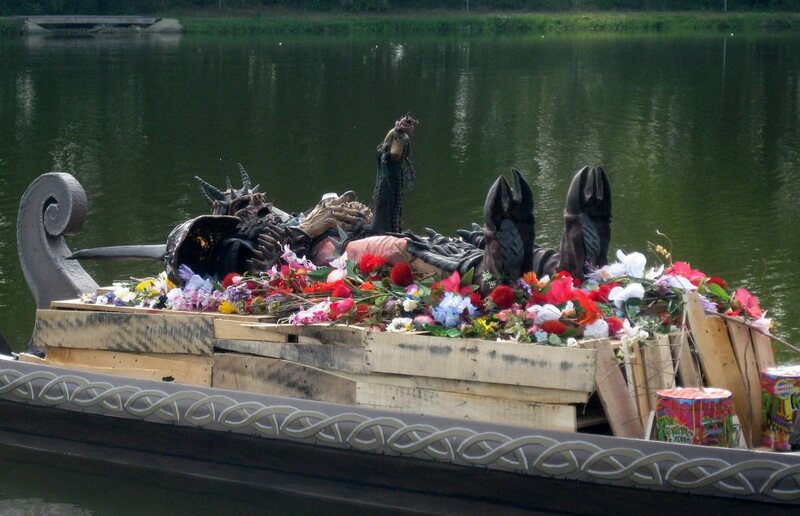 He was the face of GWAR and he was given a fitting tribute, a viking funeral. The costume was placed on a mannequin and lain on a small boat filled with flowers and fireworks. With a beer in his hands and his erect cuttlefish pointed to the heavens, Oderus majestically floated to his final resting place. I watched him sorrowfully among thousands of grief stricken GWAR fans or as we were known to Oderus, as Bohabs. Then Lamb of God front man Randy Blythe shared his memories of Brockie. He recalled how Brockie believe in Lamb of God back when they were still a little-known band called Burn the Priest. Blythe said Brockie had been proud of them and credited GWAR for helping Lamb of God get started and for much of the band’s popularity amongst metal fans. Adam Green, horror film maker and creator of the FEARnet.com television series Holliston followed. Brockie co-starred with Green on Holliston as Green’s imaginary friend. Green said it was an honor to be great friends with Brockie and to have been one of the few mortals lucky enough to write for and direct the character of Oderus. The audience laughed as Green recalled how the Oderus costume smelled like “a bag of rotting dicks that was left in a trash can full of curdled milk.” He then pulled out his cell phone and played a voice mail that Brockie had left only days before his death. This tore me up inside and made the hairs on the back of my neck stand to attention. 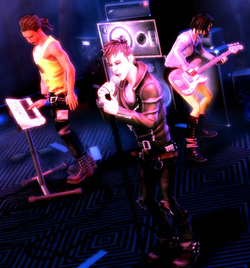 I wasn’t the only one deeply moved by this, much of the audience was sobbing while this was played. The service concluded with eulogies from Jon Freeman, the band’s publicist, and from Michael Bishop, the original Beekcake the Mighty. They were both close to Brockie it seemed difficult for them to express themselves without letting their emotions take over. They each expressed how much they loved and missed him and said that GWAR will continue with him in the hearts and memories of all his friends and fans. Afterwards, bagpipes bellowed as Slymenstra Hymen lit torches and marched towards the lake, where a marksman shot a flaming arrow to ignite Oderus’s boat. She wore viking armor and brightly colored angel wings. 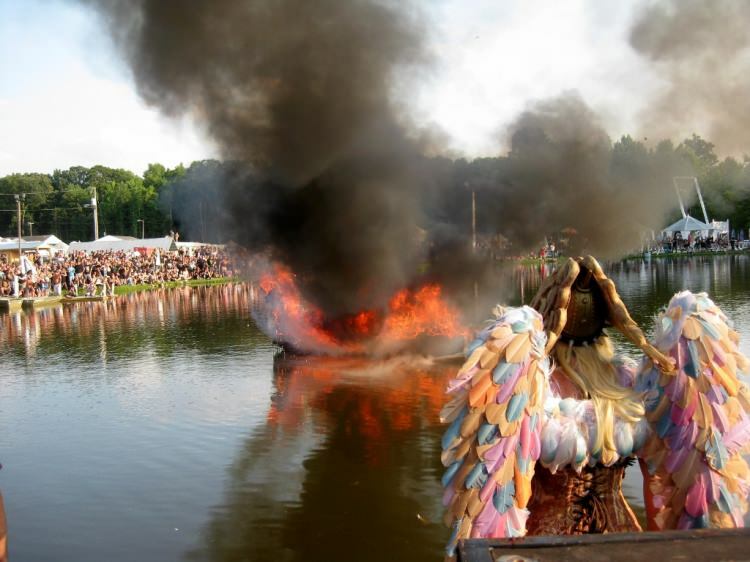 The crowd silently watched as the boat and costume were cremated. The tears continued to rain down the cheeks of the spectators, myself included as we watched the fireworks and smoke emit from the lake. Even in sorrow we managed to cheer and applaud as Slymentsra yelled “To Valhalla!” I smiled at the thought of Oderus now ruling up there amongst fellow warriors. Fifteen or twenty minutes passed before the local fire department showed up to extinguish what remained. After the crowd dissipated, I made my way to the remains and gathered a small amount of the ashes into a GWATER bottle to remember this beautiful, heart-wrenching farewell.